It’s not often that the Government tells you it’s a rather good idea to buy insurance, but in the event of Intellectual Property Insurance they do. Take a look at https://www.gov.uk/guidance/intellectual-property-insurance and they actually say, and we quote, ‘you may find it has numerous benefits’! The Intellectual Property Insurance we offer at Prizm Solutions is designed for SME businesses who don’t have a multi-billion pound fighting fund to help them defend what may be their biggest asset, from an attack anywhere in the world. On the other hand, this type of policy can also cover the costs associated with patent infringement claims being brought against you, including legal costs, damages, settlements and counterclaims. Intellectual Property insurance can cover the costs associated with enforcing rights if someone else infringes your Intellectual Property and in the worst case scenario, it can even cover your lost profits should you lose an infringement case. As one of the leading independent insurance brokers in the Midlands we often get asked, what is IP? Intellectual Property includes patents that protect your inventions, trademarks that protect your brand, copyright and even trade secrets. Most start-up businesses have very little Intellectual Property initially apart from a name and a brilliant idea. Problems arise if someone else thinks that they are also brilliant and they have the same or a very similar idea, how are you going to afford to defend yourself and fight back if they rip you off, especially if they are in another country? If you’re looking for third party investment you may often find that they will want some Intellectual Property protection to be in place first to prevent another entity stealing your concept, or brand or idea and patenting it themselves. Anyone who has had cause to see a specialist solicitor will know that it is not cheap. 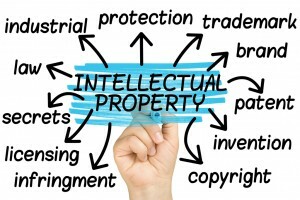 So Intellectual Property insurance gives you a fund of money and access to specialist help and assistance for a fixed annual cost, called the premium, to protect you and your unique ideas. This type of insurance can sometimes be covered under a Legal Expenses policy BUT in most cases it is not covered and therefore the only way to protect what makes your business unique is to purchase Intellectual Property insurance cover. We are experts in a very wide range of commercial insurance and as an award winning independent insurance broker our experienced team are on hand to help and advise you on the types of insurance your business needs, and in specialist areas such as Intellectual Property insurance, you can save yourself a lot of time researching the internet with a quick call to us. You can also have confidence that you have received the right advice relating to your specific business. Our founding principles are to be open, ethical and honest with our clients. We will never sell you an insurance policy that you don’t need. This makes us different to many insurance brokers you may have come across. Another point of difference is with regard to how you pay for our services. We prefer not to take a commission from the insurance companies we place business with. We prefer to operate on a fee basis which is possible in most cases. Please give us a call or drop us an email and we will be very pleased to give you the benefit of our knowledge and experience on Intellectual Property insurance or any other kind of commercial insurance. You will find our contact details here.